Loyola’s long-running café closes its doors. Last winter, the G-Lounge on Concordia’s Loyola campus was home to a bustling student-run café. Today, the bright, spacious hall on the CC building’s fourth floor sits locked and empty. The fraternity flags that adorn the walls are still visible through a crack in the doorway. There was no formal announcement of the G-Lounge’s closing; The café’s last Facebook post, in March, was an ad for a Greek salad and grilled cheese trio. After it closed for its annual summer break, the G-Lounge never reopened. It’s an abrupt and unfitting end for a café that was one of Loyola’s main hangouts for over 40 years. Concordia’s Inter Fraternity Council (IFC), a union of four fraternities and three sororities, opened the café in 1973. Early on in its history, in addition to snacks and coffee, the G-Lounge sold cigarettes. It also had a license to sell alcohol, which it lost in 1985 after “some fraternity shenanigans,” according to a video interview with former manager Blake Snow. Even in its final days, the G-Lounge was a popular study spot. “If you were to walk into the G-Lounge at noon [or] 1 p.m., you would see every table was full,” said Sita. In its last year, the G-Lounge was plagued by issues with construction, management, and staffing. Sita said she arrived after summer break in 2017 to find structural damage in the ceiling, as well as water damage in the food preparation area, which took nearly the entire semester to fix. Then, after a brief two-week stint in the winter of 2018, the café was forced to close again when one of its two managers resigned for personal reasons. However, Sita said the café’s biggest problems began well before she arrived at the IFC. 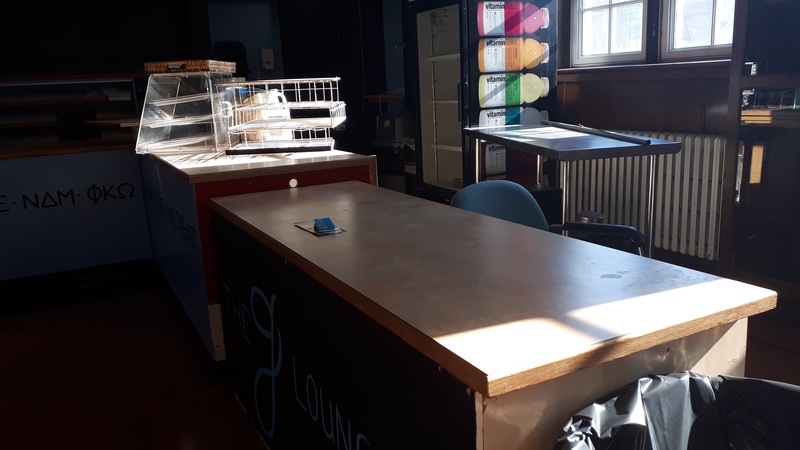 In the years leading up to its closing, the G-Lounge was facing new competition on campus, including a Tim Hortons in the Science Complex and a Hive Café in the Student Centre building. Sita said that having rules against outside food would have only chased more customers away. The café also suffered from a lack of volunteers. “Because we were in a bit of debt, we asked for people to volunteer their time instead of being able to employ [them],” said Sita. She said the IFC is still paying off its debt from the G-Lounge. Despite its struggles, the G-Lounge reopened last March, and stayed open until the end of the academic year. However, with the café in financial jeopardy, the IFC entered into talks with the Dean of Students office (DoS)—which administers the G-Lounge—about giving up the space. At the time, the Concordia Student Union (CSU) was interested in co-managing the café. Finally, after much deliberation, the IFC decided to stop renting the space from the DoS. “A vote was passed, and we decided that we were no longer going to be running [the G-Lounge],” said Sita. She said the CSU would eventually like to have food services in the G-Lounge and make it more open to the public; currently, the space must be booked in advance through Hospitality Concordia.